I have never been considered “shy” and have always had friends/acquaintances. I ran for school president in high school. I performed in plays and musicals in elementary school, high school and University. I have performed solos in choirs and sung in bars, churches and coffee houses. I have taken courses on public speaking and leadership. I have spoken on panels and led workshops. I have delivered speeches and soliloquies. I have served on my union executive. Many of my friends/acquaintances would describe me as an “extrovert” based on my public appearances and the types of volunteer and paid roles I’ve been drawn to over the years. What they do not see is me feeling utterly drained and exhausted after social events, often physically manifested as gastrointestinal issues, headaches, and fatigue. They didn’t see me coming home from school as a teenager and literally submerging my head under the water in the bathtub to muffle the world for a few minutes, or bury myself in a book, under earphones, or in a musical instrument so that I would not have to interact with others for a few hours. There’s a reason that I preferred solo swimming or cross country running to team sports, and why I was drawn to editing the school paper all alone in my little office instead of spending time in the cafeteria. I just didn’t realize what that reason was. I was, and am, a bit of an introvert. It’s almost humorous that I persisted in calling myself an extrovert for so many years, despite the intense need to be alone to recharge after being “on”. I’m sure that my introversion was easier to dismiss because I married a man who was just as content as I to silently read a book or sit outside listening to the pond instead of socializing when we got home from work and needed to unwind. 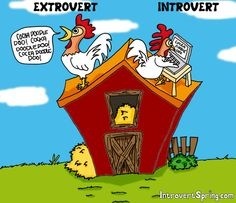 I recall being upset after a Myers-Briggs assessment labelled me an introvert during a workshop. Surely the test was skewed in some way. Me? An introvert? But I love people. I have friends. I’m not shy. I fought the “introvert” label fiercely until my daughter gently guided me to see that I could live with, honour, and respect the part of me that needs down time in order to function. I was on bedrest for the last trimester of my pregnancy. My only job was to gestate. I went from a career of multitasking and being “on” to being an incubator. At first, I thought I was going to go insane if I didn’t have contact with hundreds of humans each day, as I normally did in my itinerant role for the school board. However, after the first week of “alone time”, during which I came to terms with my physical limitations and accepted the fact that I would need to ask for and receive help from others, I also realized that I had found the experience of being alone to be recharging and peaceful. I wasn’t losing my mind, as I had feared. I was, in fact, more clear-headed and optimistic than I had been in a long time. I started to write again, after years of deciding that there were more important things to do. I connected with online support groups for high risk pregnancies and found soul sisters in infertility and loss through Twitter and Facebook groups. Strangers around the world gave me the virtual hugs that I needed at 2am, and I responded in kind at 2pm. People I had never met were praying for our baby, and I for theirs. I never would have walked into a real life support group with real people, or even joined a phone support group. Our daughter made it possible for me to reach out to others in a very safe way. I could engage or disengage as often as needed with my online peeps, and I never felt overwhelmed by the needs or expectations of others. Willow also gave me the gift of experiencing true stillness. I so often had to just be with myself and my emotions while on bedrest. There was no idle chatter to distract me, no social or work obligations to cover up the thoughts in my head. She needed me to rest my body so that she could safely continue to grow. In coming to terms with this, I realized how much of the constant activity in my life had been “filler”. I never really knew how to rest. I rarely gave myself permission to just “be”. I had been forever running away from myself and my thoughts, and as a result, was emotionally and physically spent at the end of each day. Fast forward to our return from the hospital with a jaundiced, hypoglycemic little baby who was losing weight every day. I was overwhelmed by the influx of people who just “had” to see the new baby and by the sheer volume of unsolicited and conflicting advice from medical professionals and seemingly every other person we came into contact with. My only job at this point was to nourish my wee one, and I was determined to transition Willow from tube and bottle feeding to breast feeding. The only way I was able to do this was to literally close my door to the well-meaning, advice-laden visitors (even relatives), unplug the phone (which I only reconnect to make outgoing calls these days), and just spend time bonding with and feeding our baby. She was only a few weeks old, but was already teaching me to set boundaries, to focus on the things that mattered, and to ensure that both of us had the privacy and rest that we needed to survive. Many friends, family members and acquaintances wanted to visit during the “feeding struggles”, with one actually showing up on my doorstep and trying to physically force her way in while my husband literally blocked her with his body. Some people were quite offended by my insistence that we be left alone as mother and child, skin to skin, until we had established our own unique rhythm. 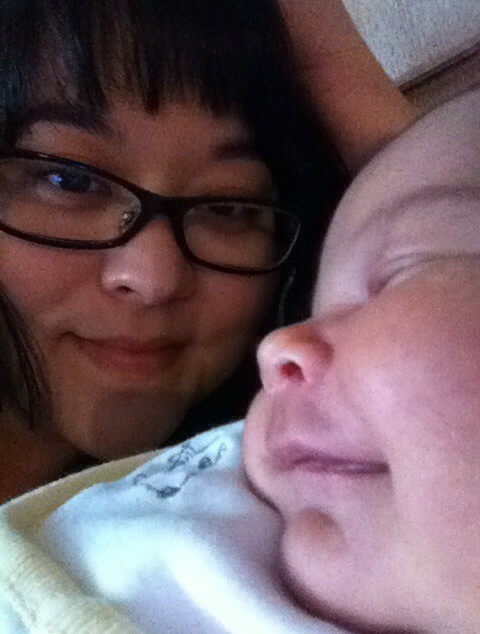 How dare I “hog” the newborn and deprive them of the opportunity to hold her?!? Before Willow, I never would have had the chutzpah to say “no” to these well-wishers, but this was a matter of sanity and survival. AND it worked. Sometimes the Universe teaches us important lessons by slapping us with opportunities to learn them until we finally “get it”. I needed to learn to slow down, to be alone, to rest, to accept who I really am as a person and to give myself permission to set healthy boundaries in order to take care of myself. I am a better person and a better mother because Willow gave me no other choice. Thank you for helping me to be the Mombie you needed and deserved, little one.